Let me tell you something. I despise rain with every fiber of my being. I'd rather walk to work through a tornado or a blizzard than deal with even the tiniest bit of rain. And you know why? My. Hair. Hates. Getting. Wet. So when I came across the Totes Bubble Umbrella, I figured I'd give it a try. 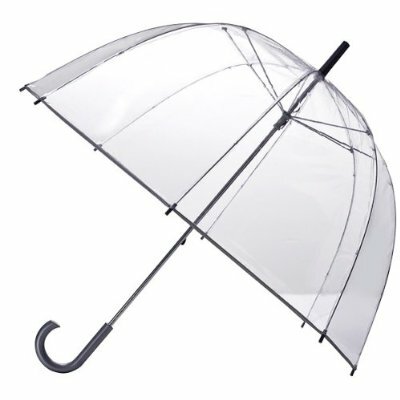 Little did I know just how much I would fall in love with this umbrella. Never before did I think it was possible for one umbrella to keep not only my body but my hair so completely and utterly dry. Never before did I think I could make it through a whole day without a single, solitary frizzy strand. Color me shocked and surprised! The umbrella itself is quite sizable -- not as big as a golf umbrella, mind you, but it's no small feat carrying it around waiting for the next thunderstorm. It's definitely too big to fit inside a purse, so I do recommend having a small backup umbrella for days you're not positive the drops will fall. With that being said, I've been carrying it for three months now and have yet to whack someone in the head with it as I walk down the street. In all seriousness, I can't believe it took me this long to buy a bubble umbrella. I'm never going back. The Totes Bubble Umbrella retails for $16.99.